Home / Stock Picks / Stocks to Sell / Amid This Brutal Selloff, Is Snap Stock Finally a Buy? Amid This Brutal Selloff, Is Snap Stock Finally a Buy? There aren’t many stocks that have been spared during this brutal stretch of trading. It’s been almost two months since the market collapsed in early October and it has yet to recover. Snap (NYSE:SNAP) is no different, with Snap stock falling roughly 25% in that time. It begs the question, has Snapchat stock fallen enough to warrant buying it? My answer is no, and the reason why is simple: Its fundamentals haven’t improved. While Snap stock has been under pressure, so has seemingly every other stock out there. Why buy Snap when you can gobble up Apple (NASDAQ:AAPL) $50 off its high? Or nibble some Adobe Systems (NASDAQ:ADBE), which is down 20% from its highs despite guiding for another strong year in 2019? I can’t decide which stock chart looks worse, Snap or General Electric (NYSE:GE). At least with the latter there are three key catalysts to watch for regarding when to buy it. If the market were still in a steady bull run and other stocks were keeping their heads in the clouds, I would wonder if Snap was a good buy. But as we just alluded to, there are simply too many superior investments after a decline like this. A closer look at Snap’s fundamentals highlight a similar sentiment. Analysts still expect the company to lose 51 cents a share this year, only a modest improvement to 2017’s loss of 62 cents a share. In 2019, expectations call for a loss of 37 cents a share. When CEO Evan Spiegel called for a break-even year with positive cash flow, readers at InvestorPlace knew not to read into that one too much. While revenue is forecast to grow more than 40% this year and 32% in 2019, it’s clear that something is off. The business is in disarray, as Facebook’s (NASDAQ:FB) Instagram property continues to eat into Snap’s user metrics. Nowhere was that more clear than when Snap reported earnings last month. Although it beat on earnings and revenue, daily active users grew just 5% year-over-year and even slipped 1% sequentially. Both numbers are disappointing. The company has had an exodus of talent hitting the exits, while juggling subpoenas from the government. That’s always a good reason to go long, right? I’m not trying to be harsh on Snap, but the outlook just isn’t that good. On the plus side, it has $350 million in cash and no debt. But that’s hardly enough of a reason to buy Snap with an $8 billion market cap. For three days in a row, Snap stock tested this $5.90 level and each time it buoyed the share price. 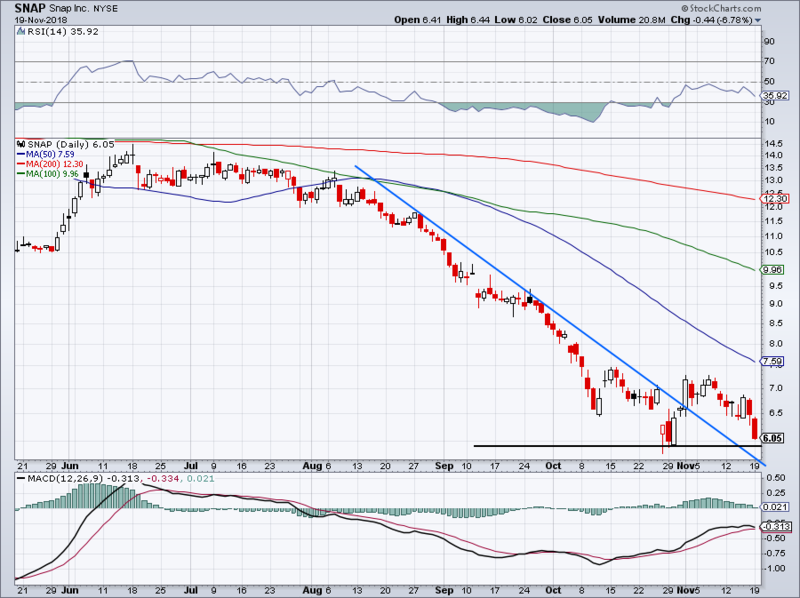 It eventually rallied through downtrend resistance (blue line) and above $7. However, those gains haven’t been able to stick and on Monday, Snapchat stock closed just a nickel north of $6. A retest of that $5.90 level is likely in the cards and should it break, a retest of the 52-week lows near $5.77 will be on deck. The one level that could save Snap stock comes on a test of the backside of prior downtrend resistance. Should Snap stock hit this level and bounce, it’s imperative that it gets back above $6. If it doesn’t, this name is likely to remain under pressure. The truth is, Snap’s fundamentals aren’t improving, and right now there are plenty of more attractive options with so many high-quality stocks down big. This company still commands a market cap of almost $8 billion, which many investors are having trouble justifying given its cash burn and lack of profitability. 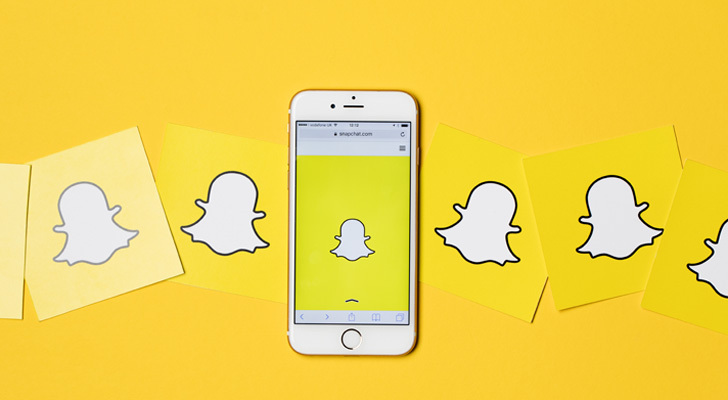 Unless Facebook and Twitter (NYSE:TWTR) turn it around and infuse some mojo back into the industry, buying Snap seems too risky and unappealing at the moment. Bret Kenwell is the manager and author of Future Blue Chips and is on Twitter @BretKenwell. As of this writing, Bret Kenwell was long AAPL. Article printed from InvestorPlace Media, https://investorplace.com/2018/11/amid-this-brutal-selloff-is-snap-stock-finally-a-buy/.